FMMT589_ SOT23 PNP SILICON PLANAR MEDIUM POWER HIGH PERFORMANCE TRANSISTOR View Diodes Incorporated. 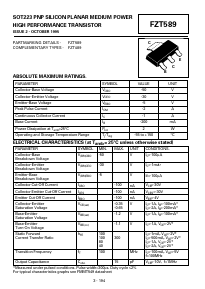 FCX589TA SOT89 PNP SILICON PLANAR MEDIUM POWER HIGH PERFORMANCE TRANSISTOR View Diodes Incorporated. FZT948 SOT223 PNP SILICON PLANAR HIGH CURRENT (HIGH PERFORMANCE) TRANSISTORS View Diodes Incorporated. FZT849 SOT223 NPN SILICON PLANAR HIGH CURRENT (HIGH PERFORMANCE) TRANSISTOR View Diodes Incorporated.